Singapore's stock market has staged a remarkable turnaround over the past month, recouping most of its lost ground in the crash earlier this year. In a U-shaped recovery, the benchmark Straits Times Index has put on 236.88 points - a blistering 9.3 per cent - since Feb 3 to close at 2,787.62 yesterday. The surge that brought the STI near to the 2,880-point level before the January crash was part of an Asiawide rally but it surpassed the 5.8 per cent rise in the MSCI Asia ex-Japan index - the region's widest benchmark - over the same period. After an 11.5 per cent dip between the start of the year and Feb 3, investors were lured back by attractive prices and expectations of monetary easing in major economies. Firmer oil prices have also stoked confidence, particularly in the energy and offshore marine segments. NRA Capital research head Liu Jin Shu told The Straits Times: "The market is being driven by expectations of more monetary easing. After China cut its reserve requirement ratio for banks this week, the hope is now that the Federal Reserve will slow interest rate hike." More easing by the European Central Bank in its March meeting next week is also on the cards, while the oil price has further recovered to above US$36 per barrel. A 25 per cent crash in oil prices in January to below US$30 triggered a market-wide sell-off, as many key sectors in Singapore tie their fortunes to the energy industries. Household names such as Sembcorp Marine and Keppel Corp were heavily belted, while local bank stocks were also dumped over concerns of bad loan exposure to failing energy firms. With investors returning to the fold, many oversold stocks turned into market favourites and sentiment warmed up particularly for the energy-related segment. 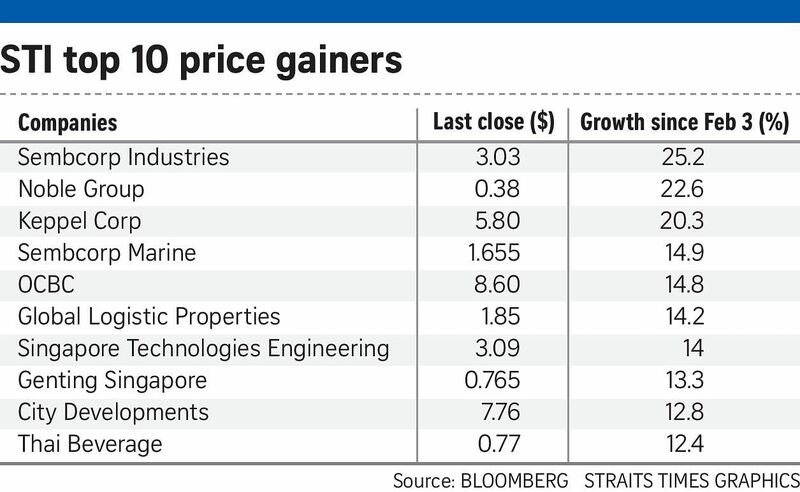 Sembcorp Industries and Keppel Corp were both among the top 10 gainers for the past month as the energy jitters eased, with price increases of more than 20 per cent. Commodity firms, including Noble Group and Wilmar International, were also among the top performers. Another cluster of blue chips - those with China exposure - rose on the excitement over easing. These include OCBC, DBS and CapitaLand. But market watchers do not see a sustained rally beyond this near-term surge, as corporate and economic outlooks remain weak. Standard Chartered Wealth Management equity strategy head Clive McDonnell said: "The easing expectations and the attractive valuations have increased investors' risk appetite for now. "But apart from the oversold nature of the market, we don't see actual catalysts in terms of improved investments or better economic growth profile."